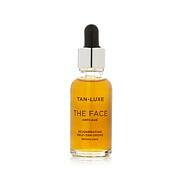 Tailor-made tanning drops transform your favorite moisturizer, serum or body oil into custom-made self-tanners. 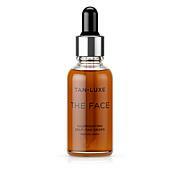 I bought this duo of Tan Luxe Self Tan Drops and gave one to my daughter. She is a golden blonde and I am light olive. The medium/dark works well for both of us. It is so much easier (and less smelly!) to be able to use your own lotion to apply it. In fact, my daughter and I both say there is no smell except for your lotion's scent. You have to be careful (if you're a blonde) to not get it on your hairline or eyebrows. My husband did that and it turned his eyebrows a funny color! This product worked perfect for me. I used a about a quarter size of my body cream and mixed 2 drops for each area. Total of 12 drops. The tan color is beautiful. I have fair skin. The tan lasted 3 days with swimming every day in a chlorine pool. Tip: Take a square or 2 of tissue of toilet paper and use it to pick up the top (black part)when your hands are moisture from body cream. Easy and won't slip, wash your hands after you are finished with soap. 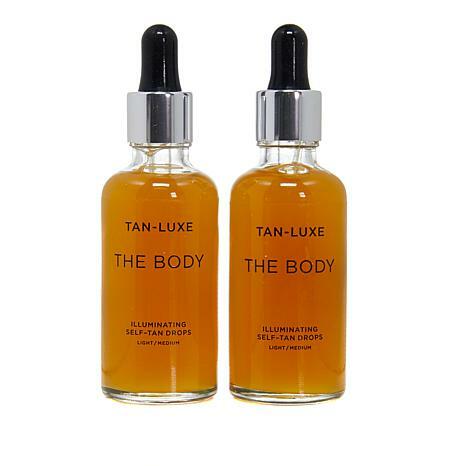 I purchased the light/medium more for the skincare benefits than the tan. So I only mixed 1 to 2 drops in my Korres Mulberry Vanilla body butter and Immediately, my skin looked more healthy with a lovely sheen but after a few hours passed my skin still a lovely radiance, with the perfect sun kissed golden glow. Tan-Luxe is a great product and I loved the results will continue to use. Got this for leg tanning to avoid wearing stockings with sandals. Used once, and liked the application and results. I so wanted this to work for me, but what I found was that it did turn me orange and I did have some streaking. I put gloves on then the lotion then drips of luxe mixed it well in my hands before applying it, so I shouldn't of had streaks. Everybody is different chemically and all self tanners don't lend a pretty color for everybody.